In my first post, I found a significant relationship between suicide rates and income inequality. Here, I present the latest data on the income inequality. The authors (Kim & Kim) of the paper I am citing used a method that's very similar to what was used by Thomas Piketty in his enormously successful book, "Capital in the Twenty-First Century." Realizing South Korea's household income survey is not reflecting actual income inequality due to sampling biases, Kim and Kim used global income tax data instead of the survey. The results reveals deeper income inequality. To show historical changes in income inequality, I have drawn three figures covering the period from 1995 to 2012. By the way, Kim and Kim's database dates back all the way to 1933. If you are more interested, please visit the database website linked at the end of this post. Here are the figures. I want to stress two points with them. First, the shares of top income groups have been growing steadily (Figure 1). In 1995, the share of top 10% households was 29.2%. In 2012, it soared to 44.9%. 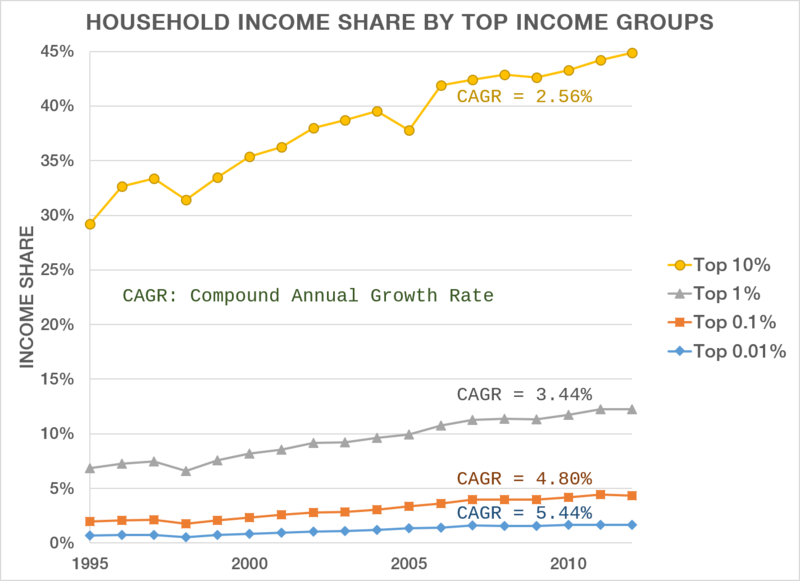 In addition, the average growth rates of income shares were greater in higher income groups. For example, the top 0.01% households' income share have risen at 5.44% annually, while the CAGR of top 0.1%, 1%, 10% households' income shares were 4.80%, 3.44%, 2.56%, respectively. 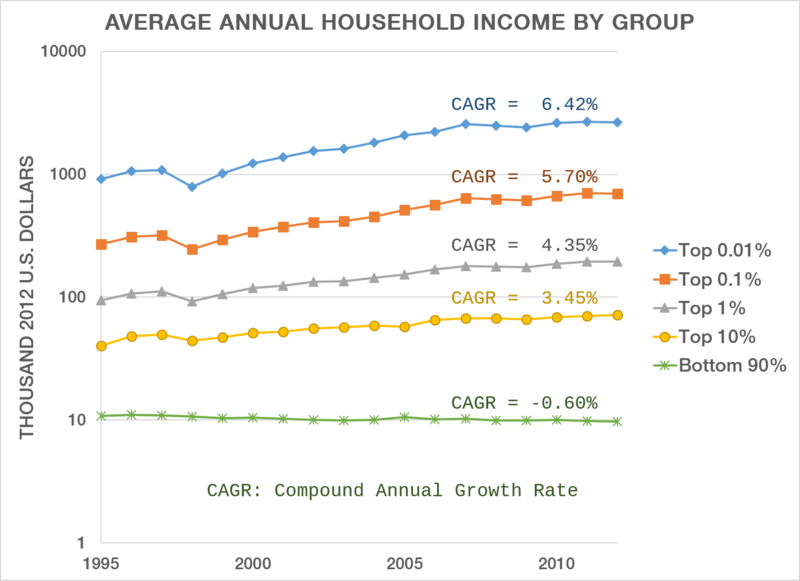 Second, the top income groups' income has increased while the bottom 90% households' real income has actually decreased. For this explanation, I have drawn two figures containing the same data. Figure 2 was plotted with a logarithmic scale on Y-axis. Figure 3 is using a natural scale on Y-axis. Top 0.01% families' average annual income was 917,193 dollars in 1995. In 2012, they earned $2,639,751 per family. It means 6.42% annual growth rate. Top 0.1%, 1%, 10% families have shown positive CAGRs, although the rates are descending with their income levels (5.70%, 4.35%, 3.45%, each). However, the bottom 90% households could not catch up. Their income has shrunk by 0.60% annually. In 1995, the entire family in the group earned $10,840. In 2012, their income fell below $10k line. 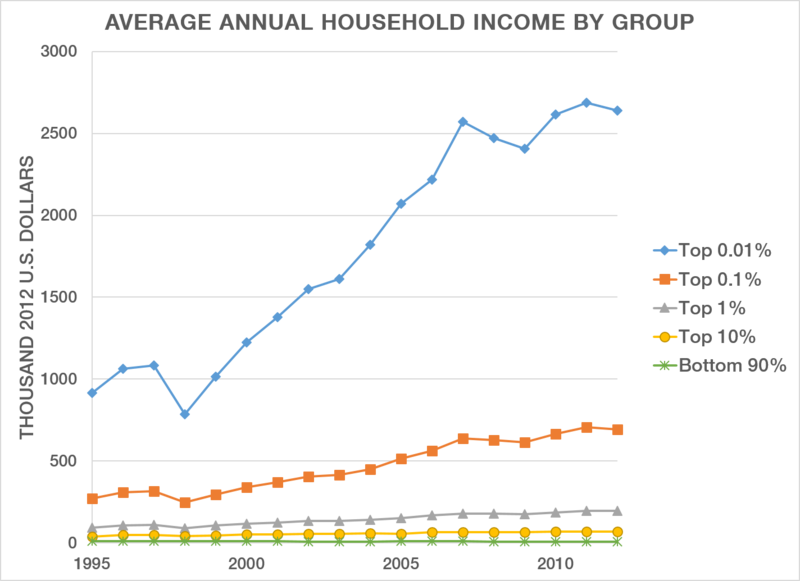 The average income of the bottom 90% households was $9784.